Someone whom I had great respect for, went to be with the Lord on the 27th. Someone whom I will always remember as an honest and straightforward man. We couldn't attend the funeral as we were just back from a vacation and it was not possible for The Techie to be away again so soon from his office. It is altogether too upsetting to write about it now. What I have here today is of course not much of a recipe. After all, most of you will know how to make Tomato Puree. I thought of including it as it is something that I almost always do - or rather I'm forced to do - because I invariably will have a kilo of tomatoes to use up on the day before we travel for long vacations. However much I might loathe the additional work in the midst of packing, clearing and cleaning, I'm always grateful for the stash of pureed tomatoes (along with a batch of fried onion paste and ginger garlic paste) tucked away in the freezer as it enables me to do some quick fixes on those lazy, why-do-we-ever-have-to-come-back days post vacations. Water - To blanch the tomatoes. Cold Water - To cool off tomatoes. Meanwhile, make a cross on the bottom of each of the tomatoes with a sharp knife and keep them aside. Also keep a pot of cold water nearby. Once cooled, peel the skin off the tomatoes. Collect skins in a bowl. 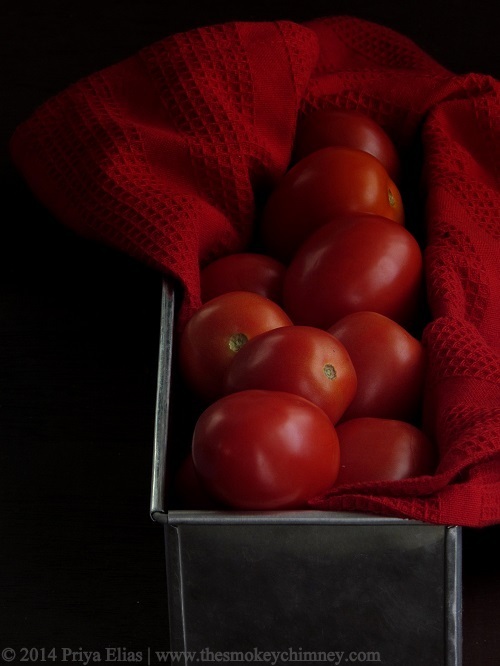 Cut open the tomatoes and remove the seeds and any juices that might pour out into the bowl containing tomato skins. 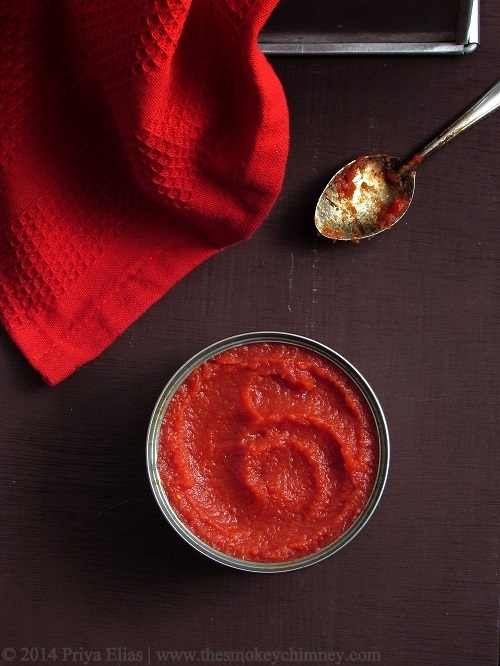 Allow the tomatoes to cool off completely and then blend to a smooth paste. Now pour the discarded skin, seeds and juices onto a strainer placed on top of a bowl and press well to extract as much juices as possible. Pour this along with blended tomatoes into a non reactive cooking pot. Add vinegar, sugar and salt as well and cook on a low fire till it gets to the consistency that you desire. Stir often and take care not to burn. The mix will sputter much initially and the 'violence' will reduce as it thickens well. Once the puree gets to a consistency that you want, switch the flame off, cool and transfer to fridge/freezer safe containers. The puree/paste can be stored for a couple or so days in the fridge and for a few months in the freezer. I always go for the freezer option. I like to make the puree really thick as shown. So what I make is essentially tomato paste which is more concentrated than tomato puree. You can stop at a thinner consistency. You can freeze thinner versions in ice trays and then transfer to a zip lock for ease of use. Paste can be stored in freezer friendly containers. 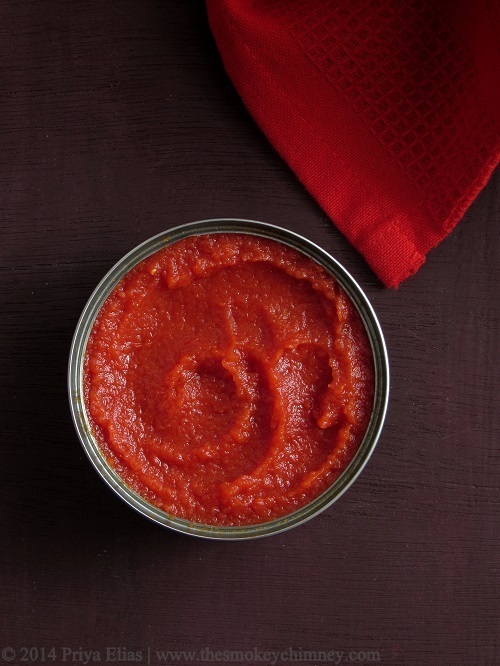 The amount of puree/paste, its colour and to some extent the consistency, is dependent on the type of tomatoes that you use. 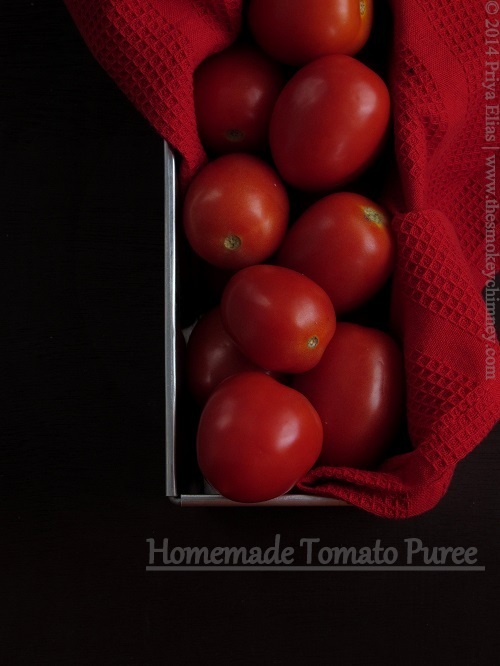 Use plum tomatoes or a similar variety. The recipe can be scaled up easily. This is a glimpse of my Dad's backyard. A familiar scene, one that is cherished. 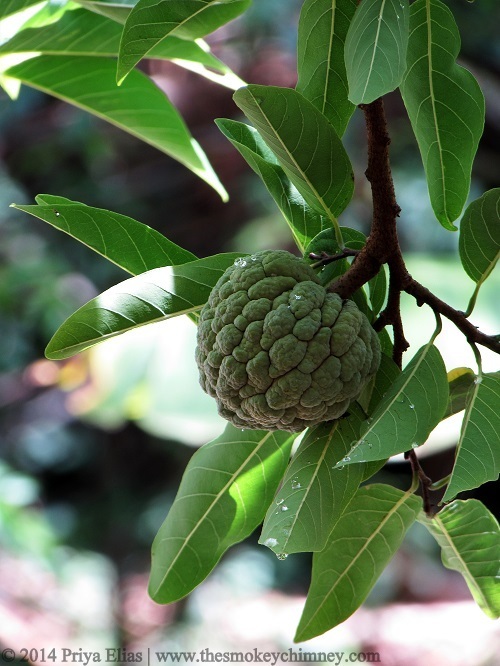 Almost a year and a half ago, I had published a similar post on sugar apple for Black and White Wednesday. The photo however was taken with a mobile phone camera and didn't quite capture what I had in mind. This is hopefully a better version. May this year be filled with Peace, Love and Laughter.